Friday February 26th 1926 I did some washing for myself and other work. Went to the city after lunch. Wrote Hattie. Had letters from Joe Woolf and Mary Byington. Emily came home with us. We had supper on the way. A pleasant day. Saturday February 27th 1926 Emily and I took an early start for Lincoln Park to attend "The Iowa Picnic." She left me at The Johnson Co headquarters where I met many I knew. Some had lately come from Iowa City. Will & Carrie were over from Long Beach. It was a wonderful day. We came home before it was late. Emilys husband came for her. Letter from Hattie. Sunday February 28th 1926 We got up early and left for "Riverside" stopped in Pasadena for Scott Metcalf and wife. It was a beautiful trip and the things we saw at "The Mission Hotel" beyond description as well as the hotel. We got home at eight oclock. Miss Eavens had been here for the day. Monday March 1st 1926 Wrote Lydia, Fannie, Sister Ida & Lizzie Lindley. Soon after dinner went down to The Victor Hotel. Warner McCall had come on Saturday. I was at 1626 1/2 7th. Letters from Hattie, Edith and Lydia. Evening with The McCalls. 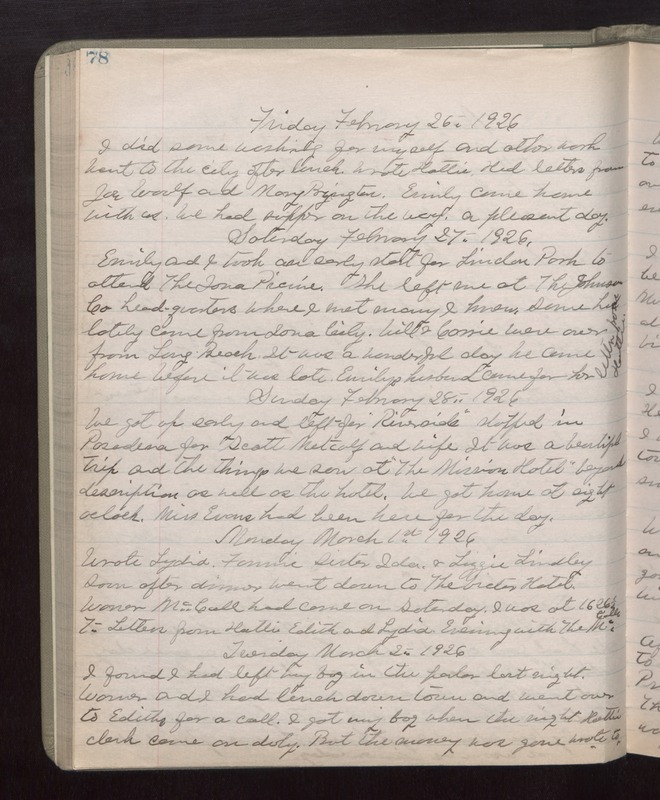 Tuesday March 2nd 1926 I found I had left my bag in the parlor last night. Warner and I had lunch down town and went over to Ediths for a call. I got my bag when the night clerk came on duty. But the money was gone. Wrote to Hattie.